Adriane Colburn, Shadow Kingdom, 2016. Today Mayor Edwin M. Lee, Supervisor Malia Cohen, the Office of Economic and Workforce Development and the community celebrated the completion of a new open space in the Showplace Square area called Daggett Plaza. Formerly an underutilized street, Daggett Plaza has been transformed into a vibrant community space, serving families and children in Potrero Hill, Dogpatch, Mission Bay, and many other neighborhoods. 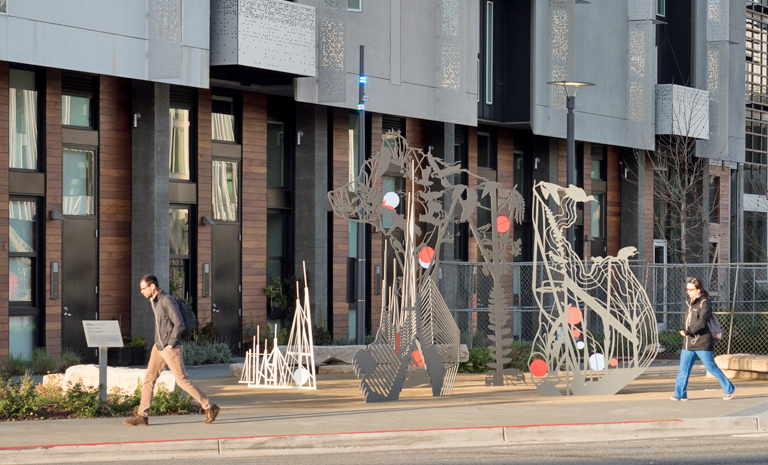 Through funding by Equity Residential, the San Francisco Arts Commission worked with artist Adriane Colburn to create a permanent sculpture that speaks to the history of Mission Bay. Shadow Kingdom is comprised of five stainless steel panels featuring imagery depicting the rich array of flora and fauna once found in the area. When viewed from a distance, the sculpture takes the shape of a California grizzly bear, a species that last roamed San Francisco in the mid-1800s. As the sun arcs across the sky, these once common species are projected as shadows back onto the terrain they once inhabited.